Roman and Remo like to celebrate a healthy sense of black humour topped with distinct sarcasm and irony, combined with innocent cuteness packed in colorful pop-brut style paintings and illustrations since 1999. Their Art-Exhibitions/Installations are carefully prepared and released by the Artists Roman Maeder(*1974)and Remo Keller (*1968), both born in Schaffhausen, Switzerland. The work is shown all over Switzerland, in Germany, Austria and Italy, and increasingly also in countries even further abroad. 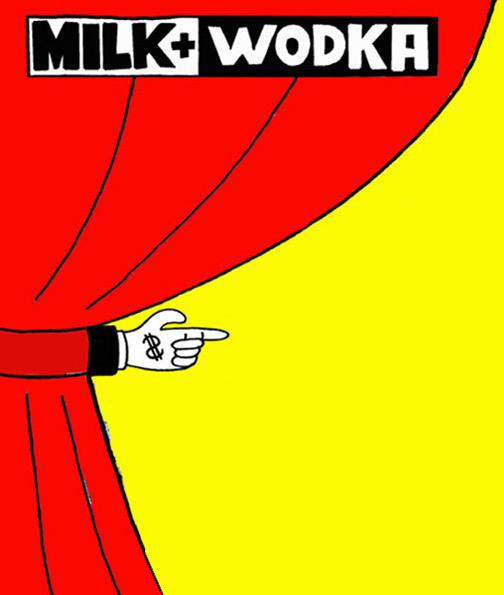 The MILK+WODKA Exhibitions take not only place in galleries, off-galleries and museums, but also in various uncommon venues, such as illegal Bars, Artist-Markets (e.g. Bazar Bizzar), discarded horse stables and cocktail-robotic-festivals. Thanks to varied and constantly expanding connections to the international artist-/music-/and party-scene, the audience is usually of a nicely multi-coloured mixture. Contentwise everything turns around the large topics of adventure, amour fou, good luck, bad luck, herbs and carrots and of course: milk and wodka. The objects, paintings and designs by Roman Maeder and Remo Keller are colourful, shiny and explosive, and they involve works of diverse styles, approaches and techniques. A conglomerate of crafty silkscreen-prints, pseudo-amateurish scribbles, avant-garde comic-art, to carefully and iconographically painted giant backlit canvases. In-between you might discover several original M+W logos, emblems and fake-advertising boards: everything is glossy, often reminiscent of trashy pop-art and art brut. The Exhibiton concept is based on the idea to create a friendly but slightly irritating art-space, trying to find a comfortable mix between Gallery-atmosphere and a cosy Living Room. You may find yourself in a “lounge-corner”, at the well-sorted bookshelf, at a bar where they serve only milk and wodka, or even in a dollhouse, or a record-player, and you will discover thousands of small and large surprises. Also, we have a mobile “comic-kiosk”, which exhibits various mini-comics, silkscreen-postcards, stickers and accessoires, everything affectionately crafted and hygienically packaged. Important exhibitions so far include: Galerie Andy Jllien (Zurich), Museum fur Gegenwartskunst (Basel), Galerie Neurotitan (Berlin), Forte Prenestino (Rome), Kunstraum Hinterconti (Hamburg), Break 21 (Ljubljana), MuseumsQuartier Wien, and many, many other places more.